Bats, witches, ghosts, black cats, skeletons, pumpkins.... Halloween is a fantastic time for fun craft activities with kids. 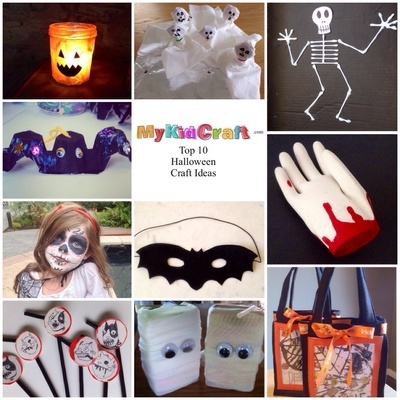 Here's our pick of the Top 10 Halloween crafts for kids from the MyKidCraft archive. Got a creative Halloween idea to share? Click on "Write for us" to become a MyKidCraft writer and get paid too! This cute pumpkin jar lantern by Claire will create a spooky glow. These spooky lollipop ghosts by Krista Jewett are perfect for a Halloween party or to hand out to trick-or-treaters. Looking for a great Halloween costume? This Day of the Dead facepaint by Lindsay Law won last years writer's competition. We love egg carton crafts and this egg carton bat by EricaL is perfect for Halloween. This easy felt bat mask by Jane doesn't need any sewing so makes a cheap and quick Halloween costume. Get out some bandages to create these mummy drinks by Lucy - great for a Halloween party. These picture frame Halloween treat bags by Janine take some time to make but look amazing and can be used year after year. Check out this fun cotton tip skeleton by Carly. These zombie cat straw toppers by diana would be great for a Halloween party table. A fun craft activity for older kids, this plaster of Paris Halloween hand is quite impressive. We put it in the middle of the trick-or-treat bowl last year and all of our visitors loved it!